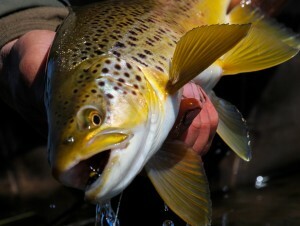 Gold brown from Arthurs Lake. Image by Peter Broomhall. Trout Guides and Lodges Tasmania (TGALT), is an industry body formed in 1981 as the Tasmanian Professional Trout Fishing Guides Association, with the primary purpose of providing anglers with a source of guides and accommodation that will provide them with a safe, appropriate and professional service. Over the ensuing three and a half decades, the Association has changed markedly expanding to include fishing lodges, yet our purpose has not. All of our Full Members are tourism industry accredited, providing assurance to anglers that the service they provide is of the highest level of professionalism and safety standards. Our guides are Bio-security Certified and work closely with Biosecurity Tasmania to help protect Tasmania's fishery and environment. We want to tell you the stories of those who do extraordinary work over a long time for the Tasmanian trout fishery and our association. TGALT recognises their commitment and contribution with LIFE MEMBERSHIP. Meet them here. TGALT works with many agencies and organisations to protect and promote our fishery and environment. If you are interested in becoming a member of TGALT, find out how here.